* 4-1/2" lower viewing glass offers 75% more product visibility. * Air piston-assisted, tempered, scratch proof service-side lid for easy no-hands opening and easy cleaning. * Extra storage capacity below presentation level. 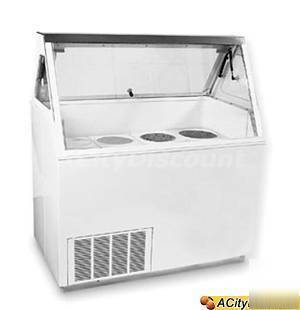 * Externally mounted product display light prevents heat buildup inside the cabinet and product discoloration. * Stainless Steel top service area. * Refrigeration system designed for air in and out the service side grille if the front grille is blocked. * Slide-out condensing unit for easy serviceability. * 10Â°F to -10Â°F temperature range. * Forced air/bare tube condenser. * Environmentally friendly R-404a refrigerant. * Reliable capillary tube refrigerant control. * Supplied with 8' 15A power cord with NEMA 5-15 plug. * Manual defrost with external drain hose connection. * UL, CUL, UL Sanitation listings.